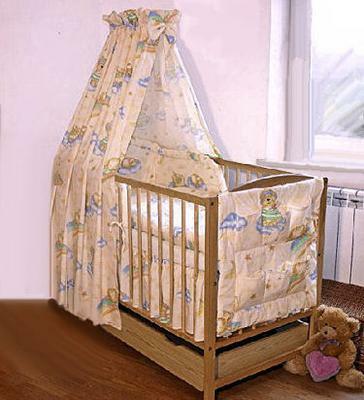 A blue and yellow custom baby bedding set with a crib canopy sewn from fabric with a teddy bear and clouds pattern for a baby boy nursery room. My baby boy's Cloud 9 baby nursery theme in blue and yellow with teddy bears is my idea of perfection. My plans are to add to the crib set and decorations that I currently have in place by decorating the baby blue nursery walls with a scattering of fluffy clouds to top it all off! When I finally have my little angel in my arms, he will be the love of my life. of the crib that will serve as "ground central" for my baby's CLOUD 9 baby nursery theme. I can imagine my infant snuggled in his crib made up with sheets and pillows that have clouds in heart shapes with angels sleeping on them. I will hang soft, fabric wall hangings in the shapes of clouds that I make myself on wide satin ribbons. Before I hang my cloud theme decorations, I will paint a cloud mural on the nursery wall as a background and if it's not too much, I may use one of the free tutorials to make a DIY baby mobile. I am looking forward to the time when our baby boy's nursery is decorated according to my specifications. I will spend many precious moments rocking my son to sleep in the comfortable rocking chair that I filled with pretty throw pillows and tucked into a cozy corner of the nursery. Thanks for sharing your story of how you chose your baby boy's nursery theme with visitors to Unique Baby Gear Ideas .